Hey there! Have you ever been affected by comparison, and when I say that, I mean, by comparing yourself to others. It’s so easy in this day and age where you have access to so much through the internet and the media to compare yourself to others. While the internet has so many amazing opportunities, it’s a big virtual world out there, where people get to be whoever they want to be, and in most cases, enhance themselves. So we have that pressure to compare ourselves to what we see of others. Of ... See More course, this does not just happen online. If you or someone you know is struggling with comparison, and in all honesty, that is probably more 80% population around the world, this episode is for you! So, Welcome back to Live with Purpose Devotional, where it’s all about learning to live a life with purpose. 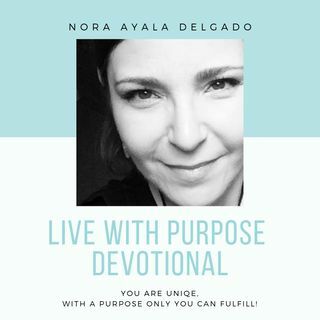 I’m your host Nora Ayala Delgado and through this show, I share my love for teaching, coaching, and the Word of God. This is episode #148 and it’s all about gaining a better understanding of comparison and what the Word says about it.